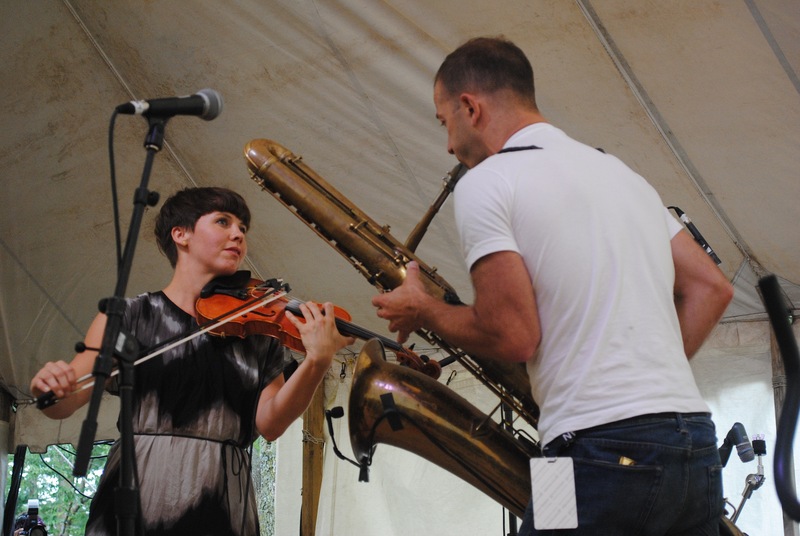 Positioned on the Island Stage at the tail end of a program of solo performances from fellow Arcade Fire and Bell Orchestre bandmates Richard Reed Parry and Colin Stetson, experimental violinist Sarah Neufeld used her own time at Hillside to give a rapt audience a preview of the bulk of her upcoming solo debut, Hero Brother. Having recorded the album with site-specific acoustics in Berlin, at recent performances Neufeld has requested that venues supply wooden boxes or cookie sheets for her to kick while fiddling away. But positioned atop Hillside’s Island Stage, a hollow plywood construct, Neufeld found an entirely new environment to route her songs through, by way of much more than geography. A student of the revered Suzuki method – the highly intensive school of violin – Neufeld weaved intricately around the strings while pounding the stage with her deliberate heel blows, delivering it all from behind a deeply concentrated gaze. But the show broke highbrow when one particular stomp coincided with a small explosion to the side of the stage and Neufeld quipped about causing it with her foot. The violinist also sliced any pretension by getting casual with the crowd in between songs. She quickly retracted the statement, however, to make reference to her other occupation, yoga instruction. It all made for a fitting segue leading into “Muscle Till Death,” a song that doesn’t appear on Hero Brother’s tracklisting and suggests Neufeld’s solo album might not simply be a one-off. She followed the track with the album’s “Forcelessness,” featuring a guest performance from Richard Reed Parry on guitar (a collaboration Neufeld announced she’d never been able to perform live before). It wasn’t the last the crowd saw of Neufeld and her associates at Hillside, though; Neufeld, Parry, and Stetson all performed a special collaborative workshop with Lee Ranaldo & The Dust as well as special guests that closed out the festival at the end of the night. Hero Brother releases August 20 via Constellation. This entry was posted in Burden of Salt and tagged Arcade Fire, Bell Orchestre, Colin Stetson, geodesic dome, Guelph, Guelph Lake, Hero Brother, Hillside, Hillside Festival, Island Stage, Richard Reed Parry, Sarah Neufeld, set list, setlist, yoga on July 30, 2013 by Tom Beedham.